Green Hills of Africa initially got a cool reception. 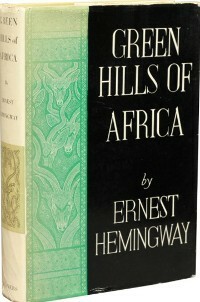 Writing for The New York Times, critic John Chamberlain claimed: "Green Hills of Africa" is not one of the major Hemingway works. Mr. Hemingway has so simplified his method that all his characters talk the lingo perfected in "The Sun Also Rises," whether these characters are British, Austrian, Arabian, Ethiopian or Kikuyu." However, two days later, writing for the same newspaper, critic C. G. Poore hailed The Green Hills of Africa as "the best-written story of big-game hunting anywhere I have read. And more than that. It's a book about people in unacknowledged conflict and about the pleasures of travel and the pleasures of drinking and war and peace and writing." Despite the better review, Hemingway said the book critics "killed" the book. He went into a deep depression, and said he was " 'ready to blow my lousy head off' ". Within a few months he was ready to blame the corrupting influence of the wealthy women in his life—his wife Pauline and his mistress Jane Mason. The result of his bitterness were two stories about Africa: "The Short Happy Life of Francis Macomber" and "The Snows of Kilimanjaro", that featured husbands married to domineering women. Green Hills of Africa (1935) is Ernest Hemingway's second book of non-fiction concerning a blood sport. The book was occasioned by an African safari the author took with his second wife, Pauline Pfeiffer Hemingway, in 1933-1934. In a brief foreword, Hemingway called the book a novel based on real people and actual events (i.e., what has come to be known as a 'non-fiction novel'). Much as Henry David Thoreau had altered time sequences, compressed events, and inserted meditative passages in books such as Walden, Hemingway altered the facts of his hunting trip, built suspense by using novelistic techniques, and employed the book as a vehicle for his thoughts on various matters, principally writing.